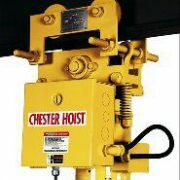 Chester Tractor Drives deliver greater productivity with existing push-type underhung crane bridges or push-type monorail hoists by offering motorized travel. 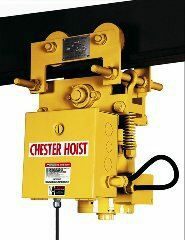 Chester Tractor Drives – Power drive for push-type hoists and underhung cranes. Travel speeds from 35 to 105 FPM depending on capacity. Designed for capacities up to 5 tons, Chester Tractor Drives are easy to install without removing or disturbing existing equipment. For underhung crane bridges the tractor is designed to accommodate any make of crane on various tracks. Twin tractor units can be used to convert push-type cranes to motorized drive. The twin tractor drives are wired into a single control panel located on one of the tractors to provide simultaneous operation. For monorail trolley suspended hoists, the single, powerful motorized tractor provides fast horizontal travel while minimizing worker fatigue. A squirrel cage electric motor and heavy-duty worm gear reducer drives a urethane drive wheel. The drive wheel engages the underside of the track, providing positive travel. Will traverse a 36″ minimum radius for standard units. 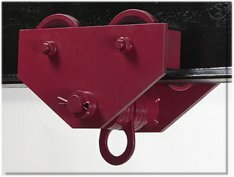 Standard Unit is adjustable for standard I-beams and flat flange beams from 3.38″ to 8″ wide. Maximum allowable flange thickness is .62″. Standard Pricing Includes Transformer, Control Fuse, 2-Button Push-button Station, 10 ft Drop Cable and Strain Relief Chain. Specify Required Voltage and Beam Size when ordering, additional charges may apply for certain beam sizes and voltages. Please Click on the Catalog Number to see the Drawing. 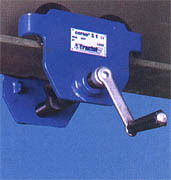 Beam Adjustment Range: Standard unit is adjustable for standard I-beams and flat-flange beams from 3.38-- to 8-- wide. Maximum flange thickness for standard unit is .62--. Minimum curve for standard unit is 36-- radius. 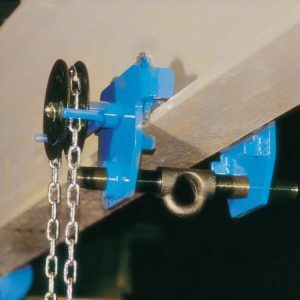 Corso Gear Trolley1-Ton to 20-Ton Capacity.Trolleys standard with 8ft hand chain drop, additional drop available. Corso Push Trolleys 1/2-Ton to 10-Ton Capacity. 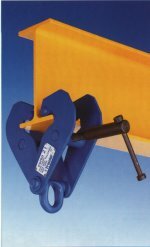 Lightweight manually adjustable clamps for a quick and easy method of attachment to overhead "I" beams.